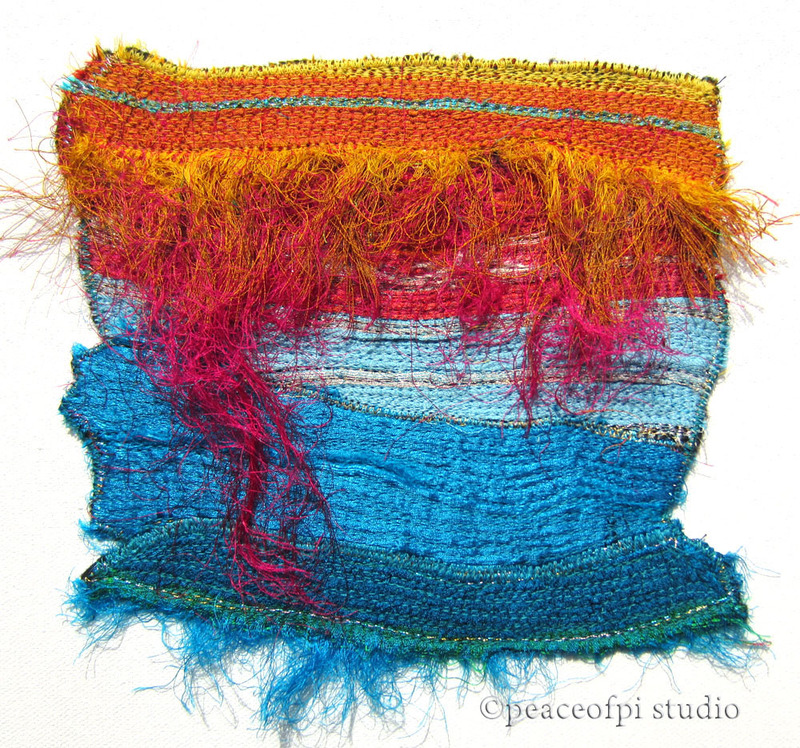 peaceofpi studio is the creative workplace of JoMo, a Canadian artist creating abstract paintings and mixed media stitched art. Both Paintings and Stitch explore the abstracted landscape, using layers of colour to create abstract impressions of nature intended to revitalize and generate a sense of peace. Questions? Visit the About page, Check out Frequently Asked Questions or send a message via Contact (bottom of the sidebar). 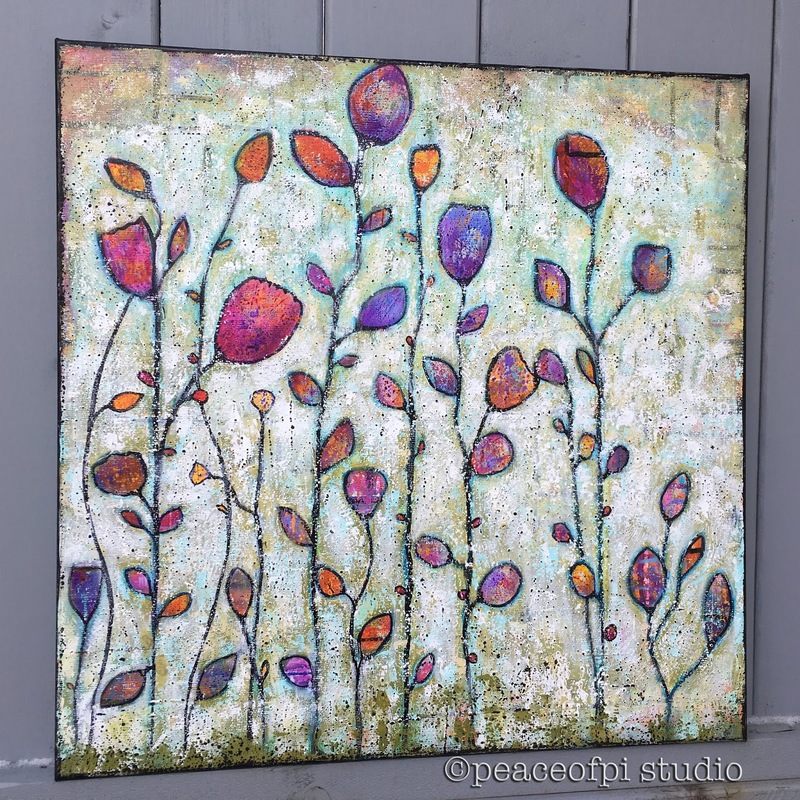 At 24 X 24 inches, Blossoms in the Wind features a soft sage green background and big bright blossoms and flower buds. 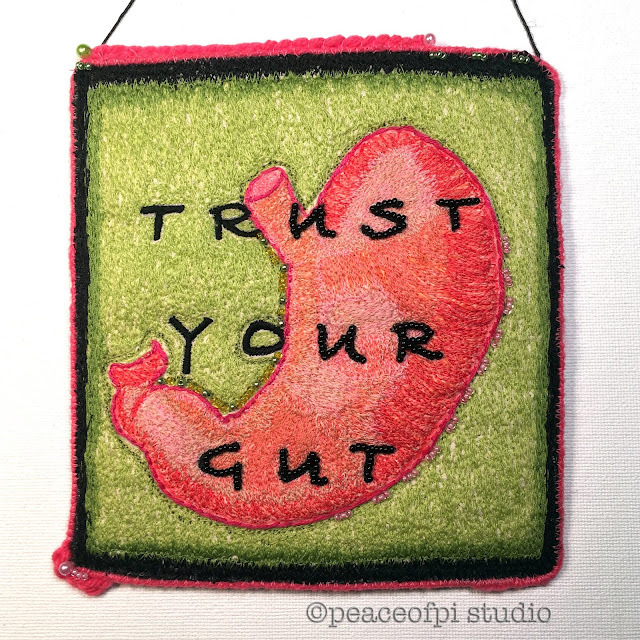 This little stitched reminder features heavy free-motion stitching and beaded letters. 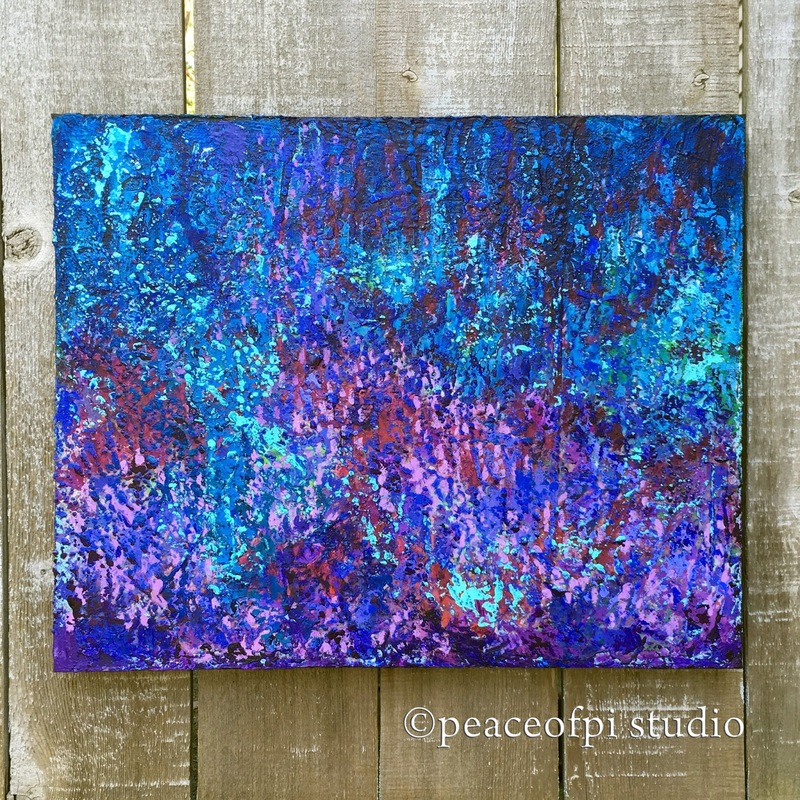 Three new paintings, part of a series titled: Connected. 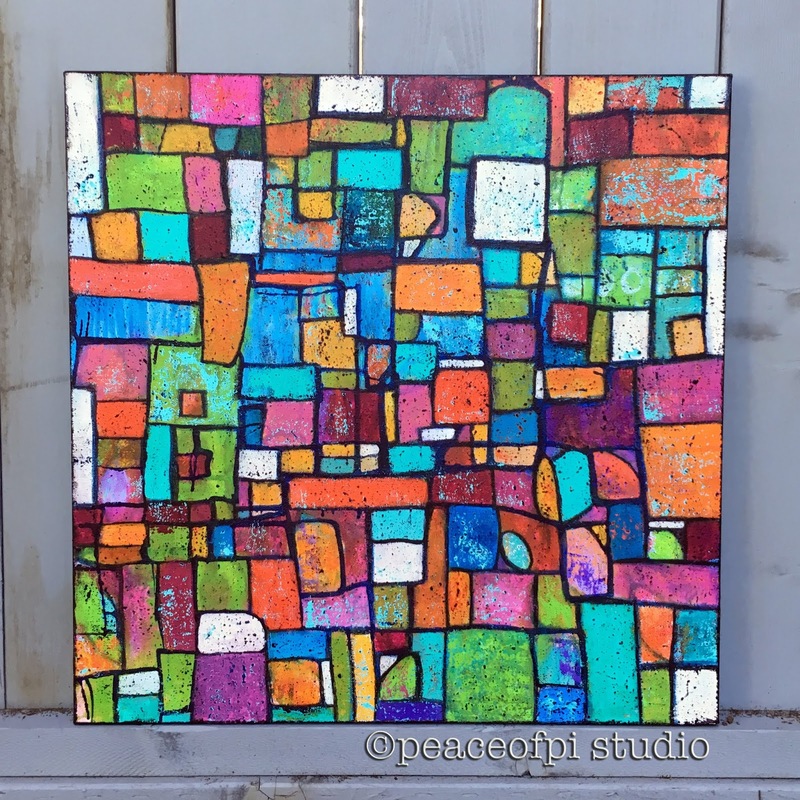 We All Fit Together, 20 X 20 inches, in acrylic on canvas is the first. Exploring interconnectedness, these abstract paintings are a celebration of how we, as people, are both unique and special individuals while also being connected, linked and part of a whole. 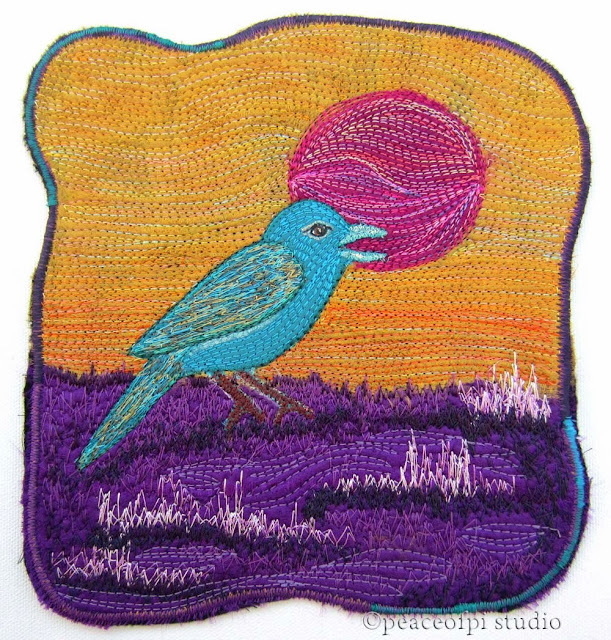 Sometimes there is beauty in the details, in things viewed from a different angle. 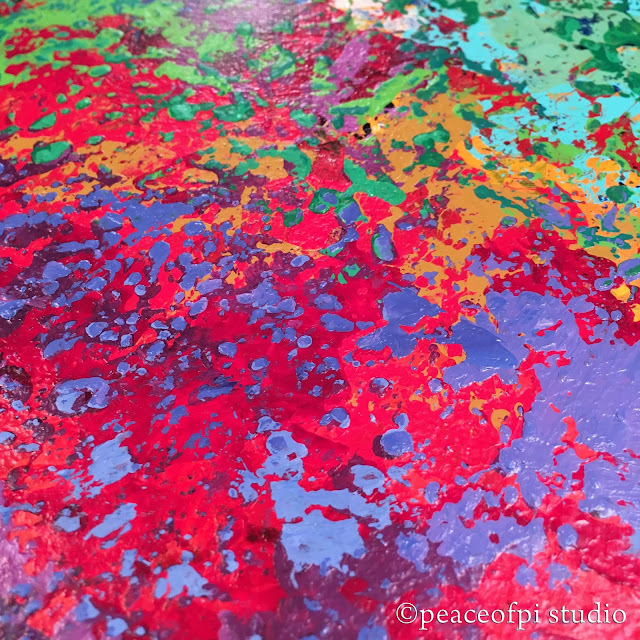 Here's a few recent abstract and floral paintings in close up. 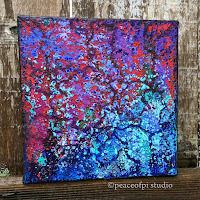 Three new abstract paintings in acrylic to share. Each painting has multiple layers of color creating an impression of nature. Lush, is the largest of the grouping at 16 X 20 inches, inspired by wildflowers in the summer. 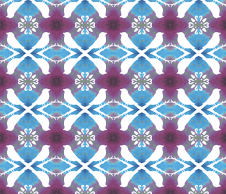 Several shades of blue interact with purples and reds creating the abstract floral. 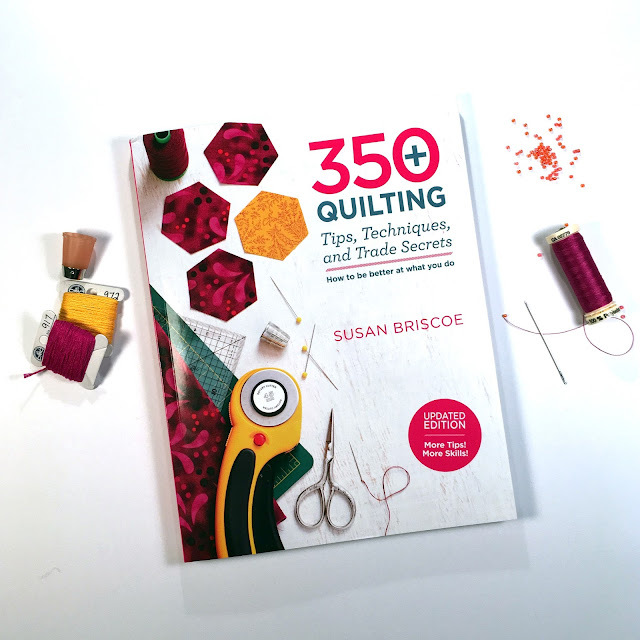 If you knit or crochet, how big is your yarn stash? 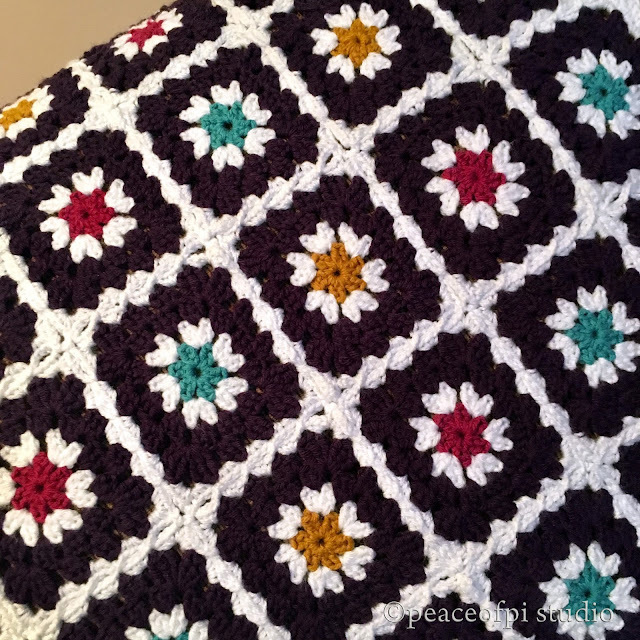 Mine is slowly becoming smaller as I keep making Granny Squares. 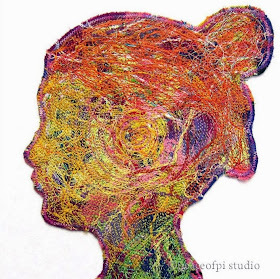 Ideal for using up scraps of yarn, Grannies are quick and creative. My pile of squares is growing. What will happen with all these disparate squares? Eventually they will become blankets and throws, but for now, they are a beautiful stacked Granny Flower Garden. 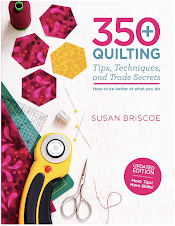 If you are a Quilter or Hand Stitcher or you want to be, check out the book: 350+ Quilting Tips, Techniques and Trade Secrets, How to be better at what you do by Susan Briscoe. 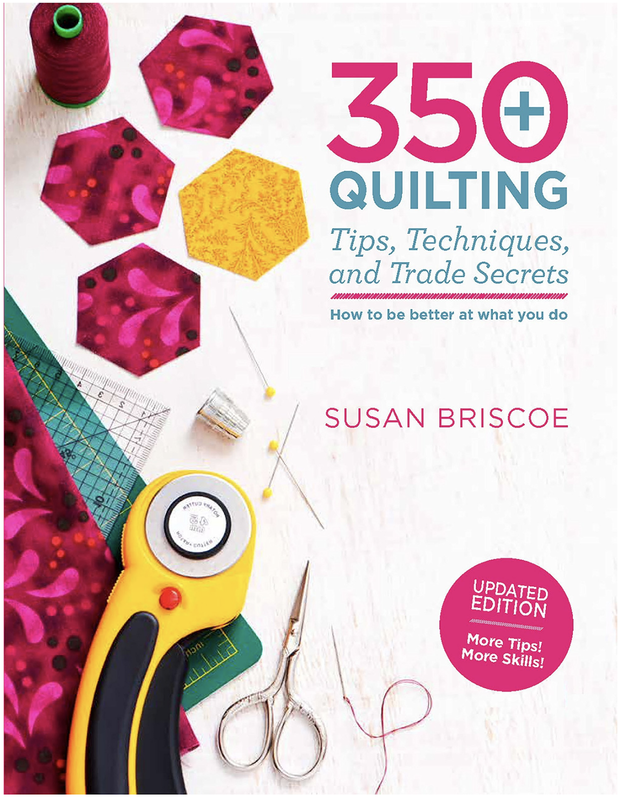 The book is full of amazing pictures, ideas and information for all types and stripes of quilters. 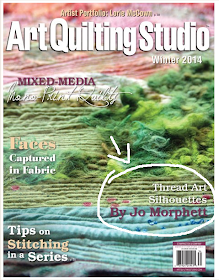 AND ~happy dance~, I am a contributing artist! 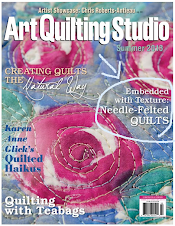 Two of my Art Quilts can be found in the pages of this all in one quilting bible. 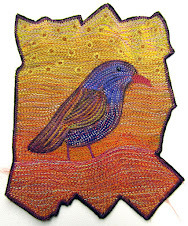 My Hand Stitch quilt Exuberant is in the Hand Quilting Section and my Brown Bird Folk Art Quilt is featured in the section on embellishments. 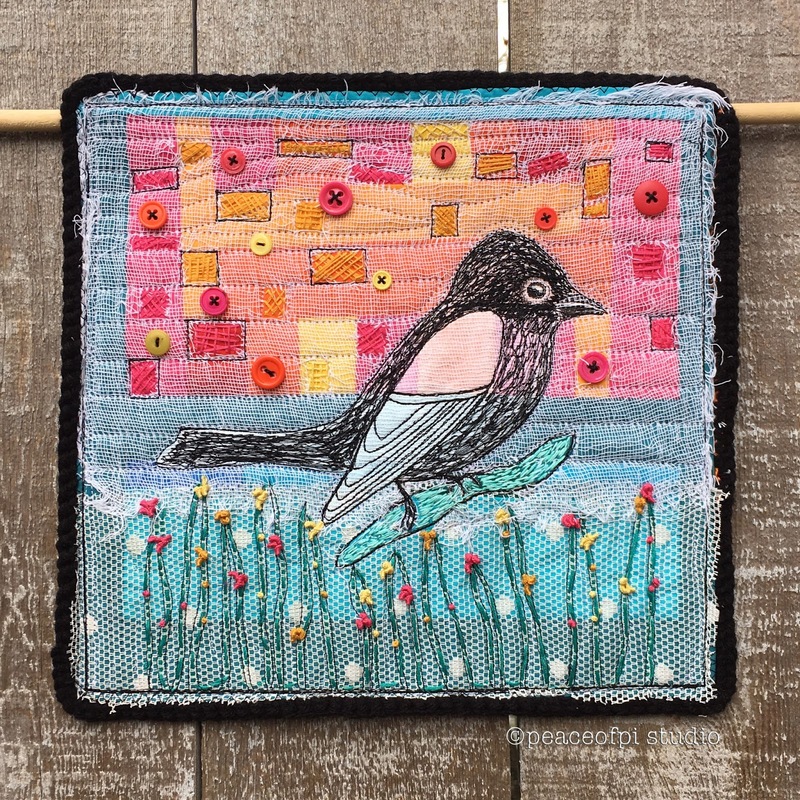 A sweet little blackbird created in free-motion machine stitch acts as a central figure in this art quilt. A colourful patchwork background in blue, teal, pink, orange and yellow is covered with lace and frayed cheesecloth (some of which is cut away) and embellished with hand embroidery stitches and buttons. 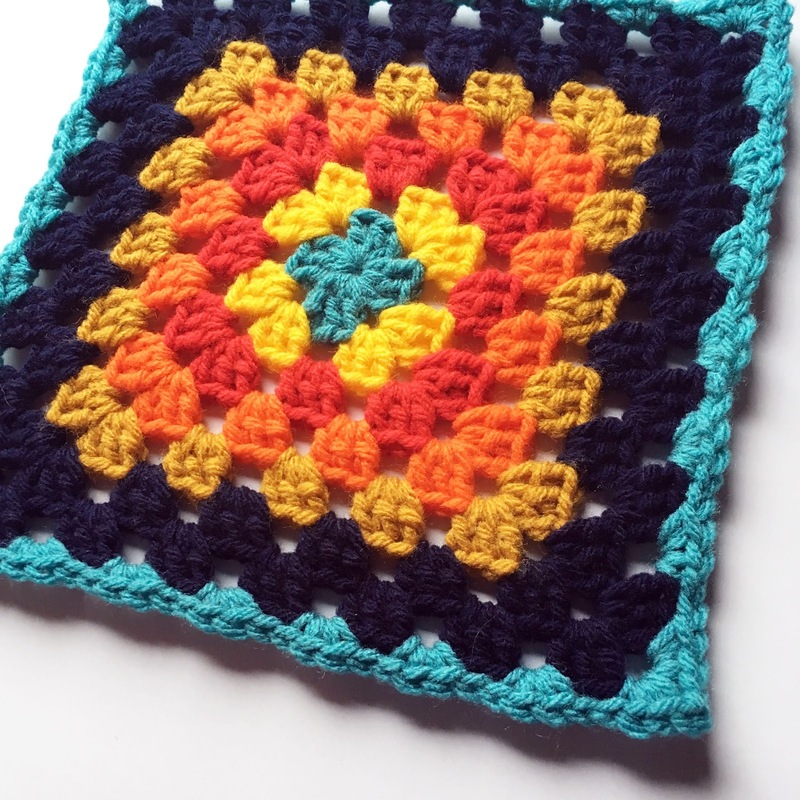 When creating a granny square project in crochet, choosing colors can be a real challenge. 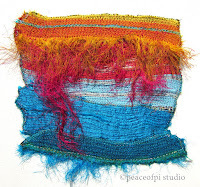 Finding just the right shades to coordinate and compliment each other is an art in itself. 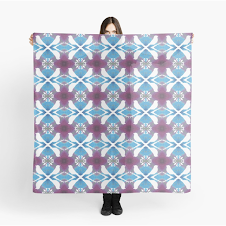 In creating this throw blanket, my first color choice was the deep purple shade that would surround and highlight the daisy-like flowers.